Consolidated Power Supply is proud to provide superior reinforcing steel solutions to the nuclear industry. Our partnership with Condor Rebar Consultants Inc. combined with our high quality certification program and experience allow us to deliver the highest-quality solutions to your construction requirements. Customers and Project Experience - With the increasing demand for nuclear construction, Consolidated Power Supply is looking to expand its already impressive customer base. The partnership has been providing services to nuclear projects including the Savannah River Site in Aiken, SC, The NEF in Eunice, New Mexico and The Hanford Vitrification Plant in Richland, Washington. Detailing Capabilities - The partnership with Condor allows Consolidated Power Supply to provide superior rebar consulting and detailing services to all levels of nuclear construction. All aspects of the rebar detailing process, including estimating, consulting, detailing, on-site consulting and rebar 3D modeling are provided to our clients. Our expertise and experience allow us the freedom to pursue nuclear level projects with the confidence that our clients expect. Project Management - Consolidated Power Supply's experience and expertise in other industries is being leveraged in its rebar operation. Our Project Management personnel provide services to ensure superior communications between all levels of the rebar workflow. Our Rebar Process Flow Reporting System, which is overseen by the Quality Assurance Department, ensures overall accuracy and accountability. Coupler Supply - Consolidated Power Supply has the capabilities to provide any rebar coupling system that is required on a project. 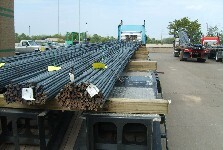 Working with our rebar consultants and the project engineers, we can detail and supply couplers as needed. All supplied couplers will meet the specified certification requirements for the project. For more information on how Consolidated Power Supply can help you with your rebar detailing and supply, contact us at info@consolidatedpower.com. Learn more about the Consolidated Power Supply's nuclear certified rebar material supply program, including couplers and other rebar accessories.